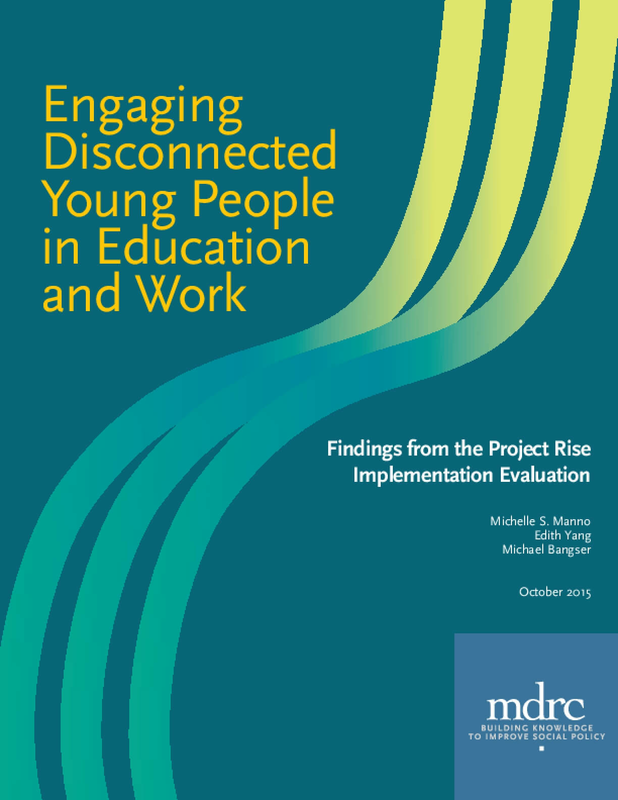 The objective of the assessment was to "measure the program's model of student service engagement as a means for skill building, educational attainment, personal development, and student experience of service." The assessment was conducted on the 2011-2012 cohort of students using a pre-test/post-test survey designed to measure changes in the students' perceptions of service, their commitment to service, and their connection with the community. 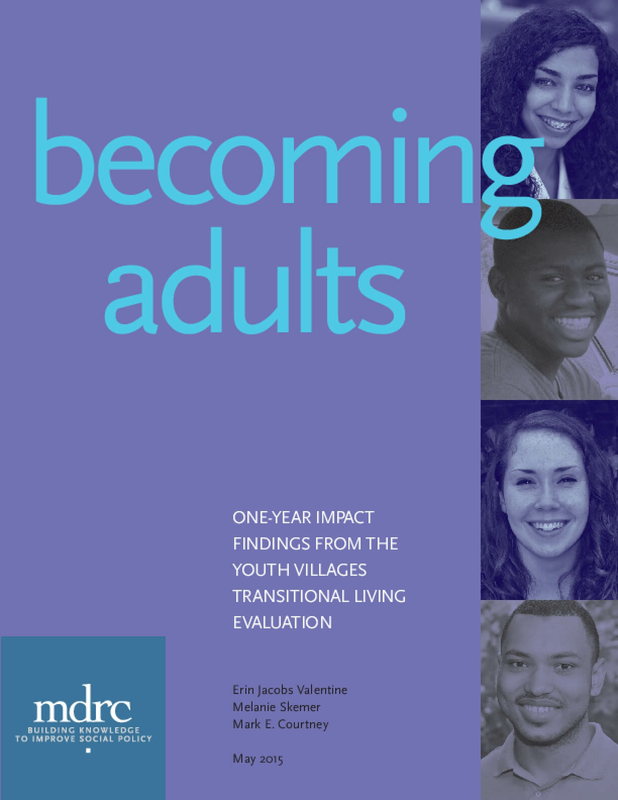 Highlights of the survey's findings include the following: for many students, participation in the program was the first time they perceived themselves as service providers rather than service recipients; the students perceived a positive shift in personal responsibility and the way they were perceived by family and community members; and following participation in the program, the students reported an increase both in the trust they had in members of their community and in the perceived trust members of their community had in them. 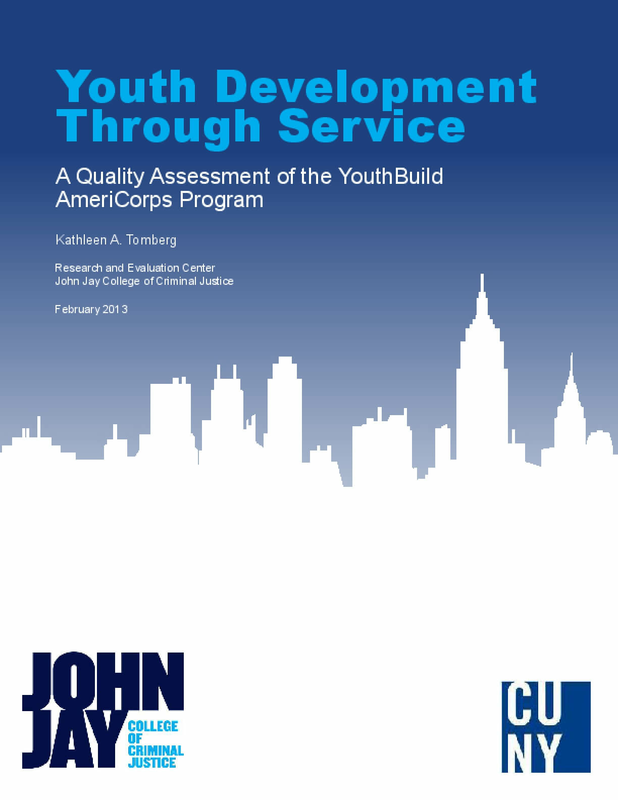 These findings suggest that the YouthBuild Americorps program is a successful and effective model that can be used to support student participants with occupational and educational services, and that participation in the program facilitates positive changes in students' attitudes towards community service and civic engagement. Far too many of the young people who age out of foster care in Illinois fare poorly in the labor market during their transition to adulthood. Since the John H. Chafee Foster Care Independence Program was created in 1999, it has been providing states with funds to help foster youth making the transition to adulthood achieve self-sufficiency. A major purpose of the program is to ensure that youth who remain in foster care until age 18 or older "receive the education, training and services necessary to obtain employment." 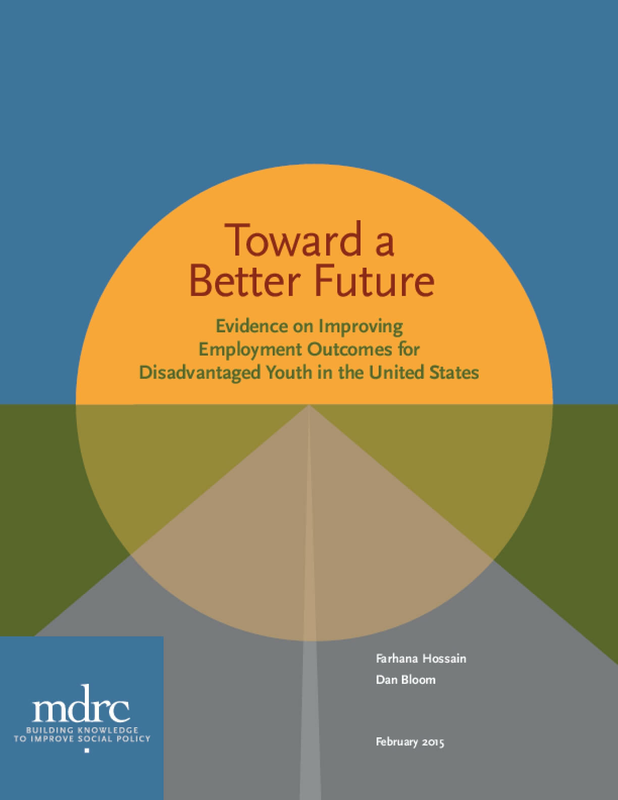 Unfortunately, the limited research that has been done on young adults who "aged out" of foster care has found that their labor market outcomes are generally quite poor. 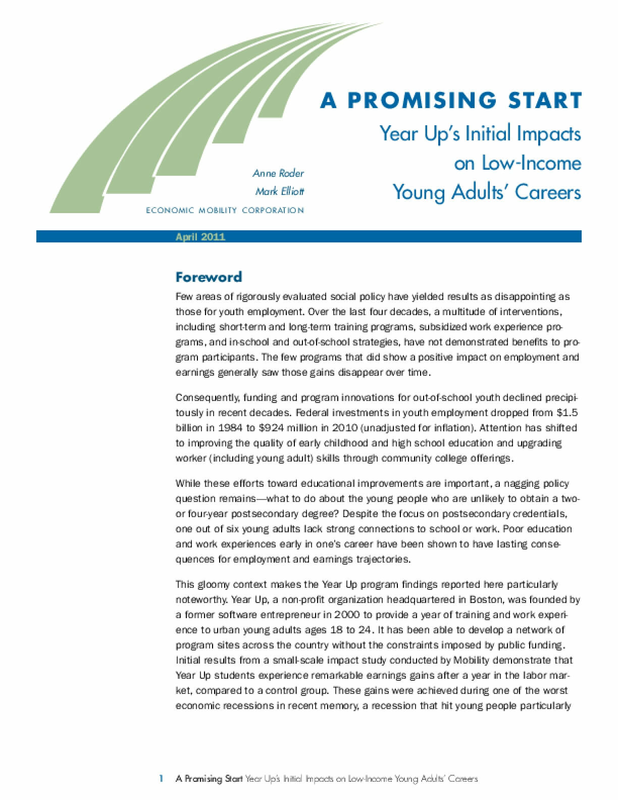 This study describes what Illinois young people told us about their current and prior participation in the labor force, including work-related training or services they received. 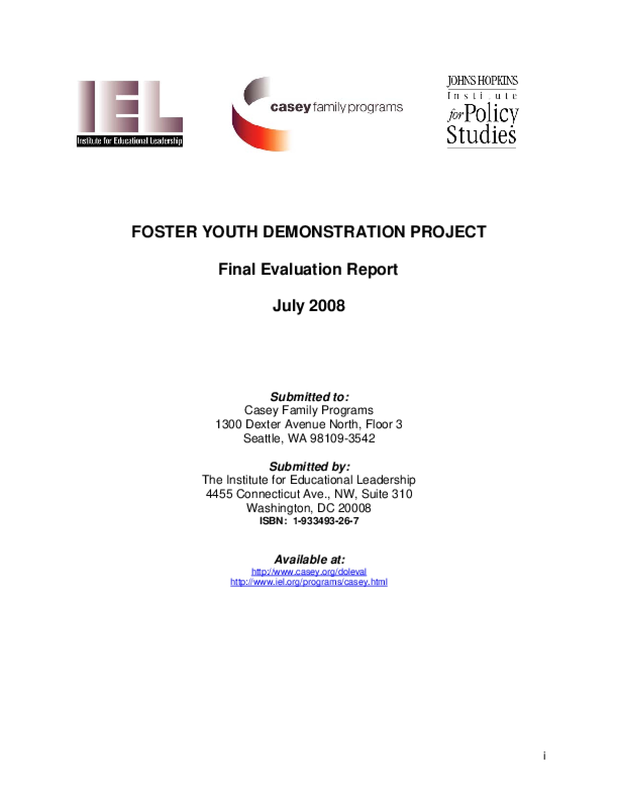 Throughout the report, we make comparisons between the young people who were under the care and supervision of the juvenile court in Cook County (hereafter referred to as the Cook County sample), and the young people who were under the care and supervision of juvenile courts in other counties (hereafter referred to as the Other Counties sample). Although most had some work experience, they had difficulty staying employed. Moreover, despite the fact that the percentage of young people who were working was greater than the percentage who were not, most of those who were employed were not working at a job that paid a living wage. 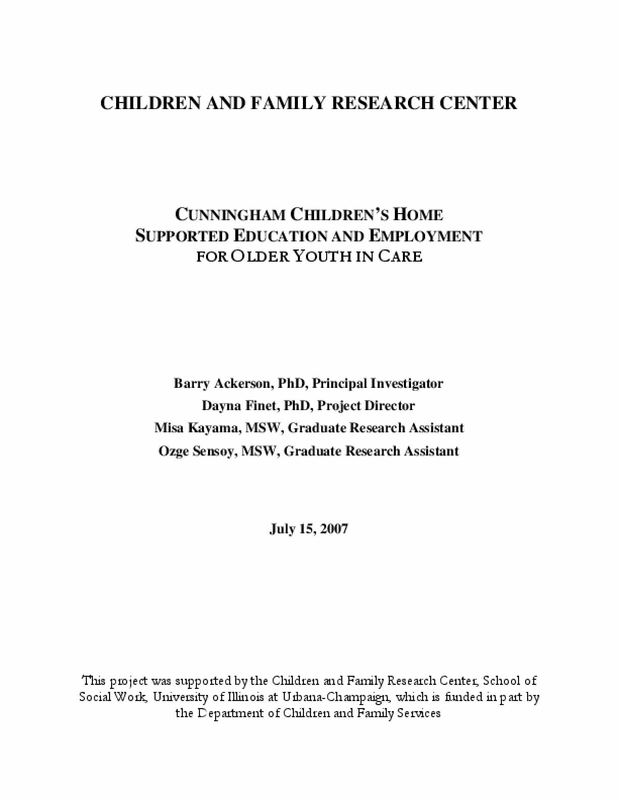 The Foster Care Independence Act specifically mentions employment-related services and supports as being among the types of assistance that states should use their Chafee funding to provide. 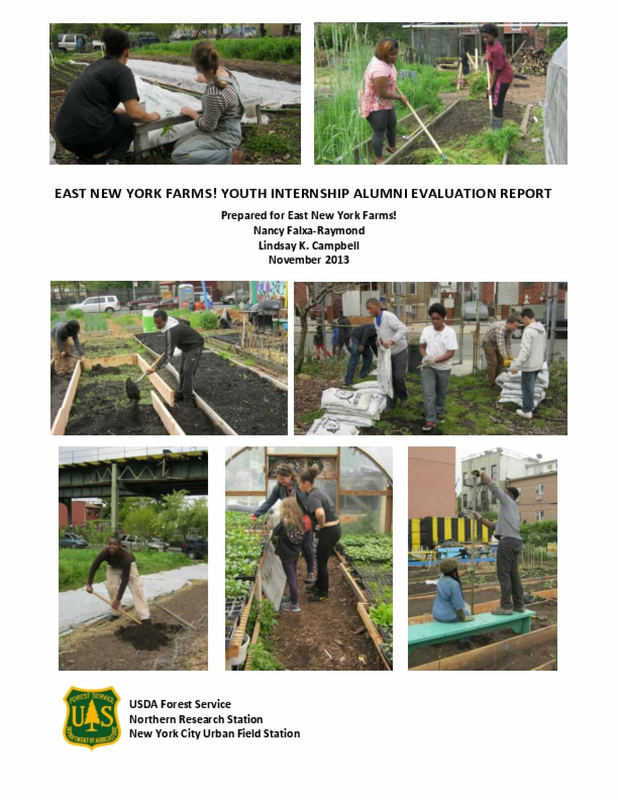 At baseline, when these young people were age 17 or 18, only 63 percent reported having received at least one service or support to help prepare them for employment. Unfortunately, the percentage of young people who reported receiving services or supports to prepare them for employment fell over time. Very early results from a random assignment evaluation of the National Guard Youth ChalleNGe Program, an intensive, "quasi-military" residential program for high school dropouts, show that the program has large impacts on high school diploma and GED attainment and positive effects on working, college-going, health, self-efficacy, and avoiding arrest. 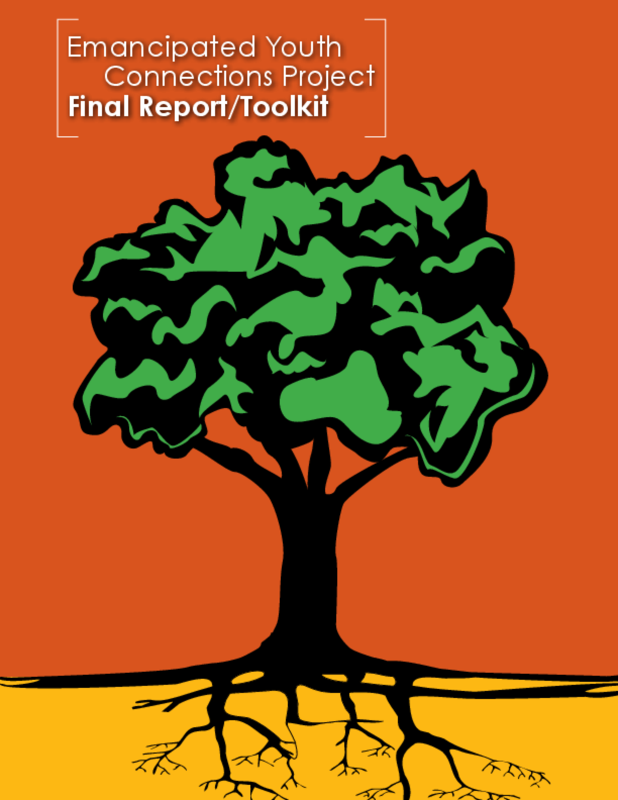 The overall purpose of this review is to provide an independent look at the current work supported through the Foundation's Models for Change Initiative in Pennsylvania. In this summary of the report I will summarize the main findings. 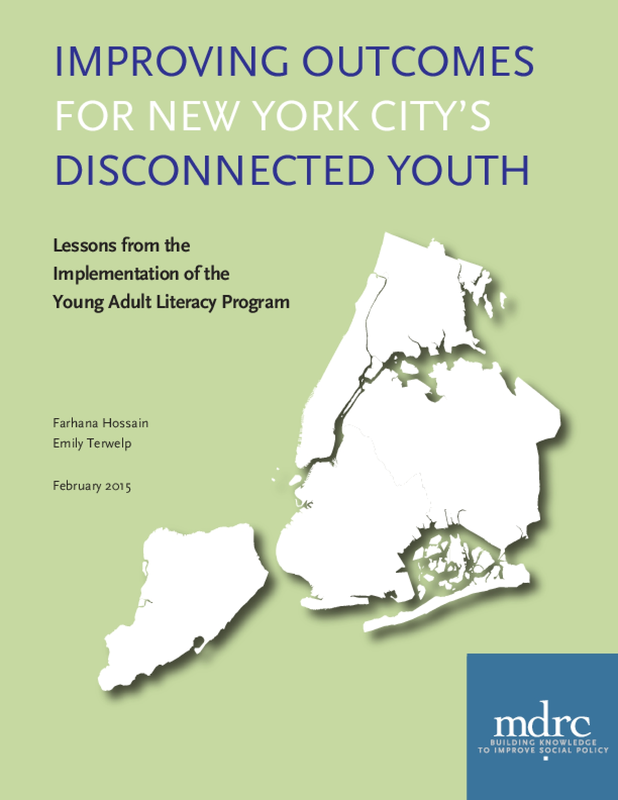 This report discusses six programs being considered by the 108th Congress for reauthorization, focusing on policies designed to assist disconnected and at-risk youth. 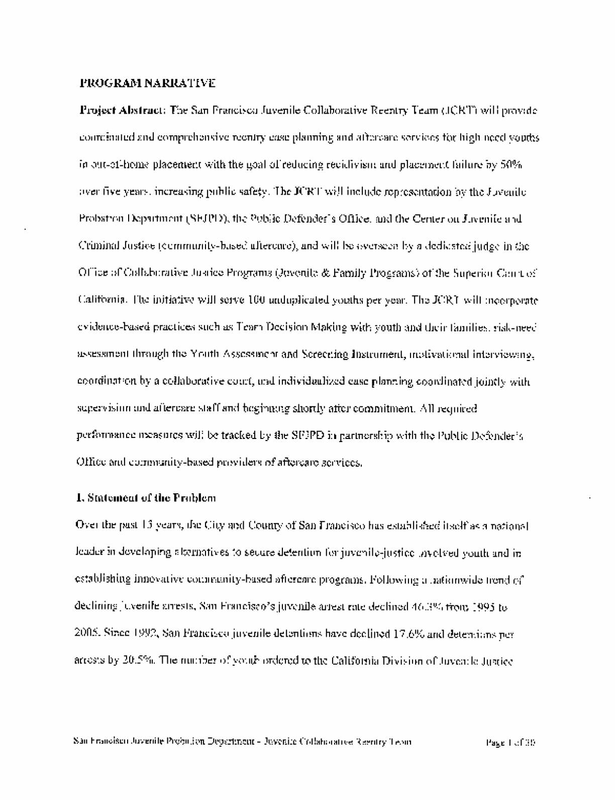 The review seeks to identify how the programs do or do not consider at-risk or disconnected youth ad how such programs might be improved. 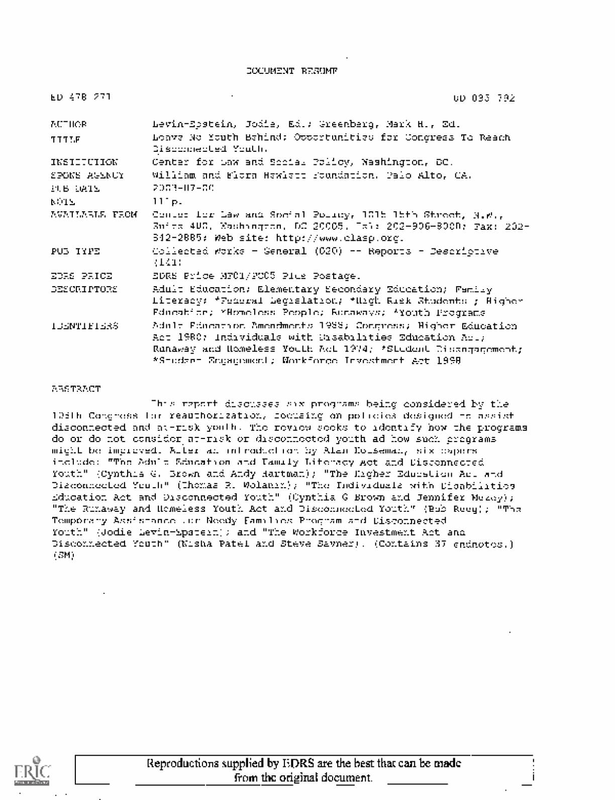 After an introduction by Alan Houseman, six papers include: "The Adult Education and Family Literacy Act and Disconnected Youth" (Cynthia G. Brown and Andy Hartman); "The Higher Education Act and Disconnected Youth" (Thomas R. Wolanin); "The Individuals with Disabilities Education Act and Disconnected Youth" (Cynthia G Brown and Jennifer Mezey); "The Runaway and Homeless Youth Act and Disconnected Youth" (Bob Reeg); "The Temporary Assistance for Needy Families Program and Disconnected Youth" (Jodie Levin-Epstein); and "The Workforce Investment Act and Disconnected Youth" (Nisha Patel and Steve Savner).